have to mark it down a bit as I feel they have used the trend of so called "craft" beers (i.e. basically over priced and marketed keg beers) to rack up the price of proper ales - they are not alone in London pubs in doing this but they pushing the £5.10 + for a pint as the norm for all pints. The Thai food is fairly simple but always very fresh and reasonably priced for the location. 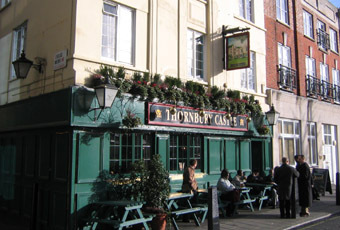 This is now probably one of the best in this part of London for decent ale. had a Bohemia Pale, a Tring brew and a Session IPA and all were eminently drinkable. Dropped by for a swift pint enroute to elsewhere. They always seem to do at least one Marlow brew and as I generally like them this is always a good port of call. Can't say I found the manager hostile - though we all have our bad days at times. Have ate here in the past and also not had a bad pint here so on the beer front is worth a visit. The parking and squatting front may be different but space is at a premium in these parts. AVOID THIS ESTABLISHMENT AT ALL COSTS! The owner is arrogant, rude and very disrespectful. My husband and I parked our car a few doors down, to take my mother in law for major eye surgery at The West London Eye Hospital. Whilst waiting for her surgery to be completed we found this little pub and contemplated having lunch. The quiet cul de sac like road it sits on is rather peaceful and away from the hustle and bustle of the Marylebone road. Whilst my husband put extra money in the metre for our parking, I sat outside the pub waiting for staff to bring us menus. The owner drove up, parked his car and got out furiously telling me to leave and find a public place to sit other than his establishment. I could not believe it and have never been spoken to - so rudely by anyone. Especially as a customer. Avoid this place like the plague. The owner is a pathetic example of how businesses should operate. He most certainly DOES NOT RESPECT CUSTOMERS. God only knows what other horrendous outrages lie within the business. I can't say I've ever noticed this pub before. It's tucked down a fairly narrow side street to the south side of the Marylebone Road. The interior feels a bit dark. But it's decked out with a fair bit of rugby memorabilia, as this is apparently a rugby pub. There was an impressive range of 6 ales on - Three Brewers Golden English Ale, Three Sods Mon Cheri, Rebellion Zebedee & Angel, Dorking Pilcrow Pale & Vale Fork Handles. After I'd ordered, I then noticed a sign stating they also had Mr Whitehead's Rum Cask. So I ordered one of those too. There was no food being served during my afternoon visit. More people were enjoying the tables outside in the sunshine, than were inside. A TV was on with the sound low in one corner and music was playing. I'm told this pub used to be a bit of a dive. But it's certainly worth a visit these days.